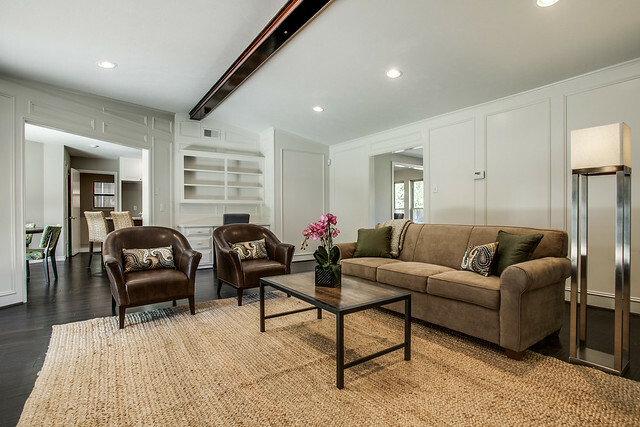 Now onto the main living areas in the house – how about a quick peek at the den before we head back to the foyer? 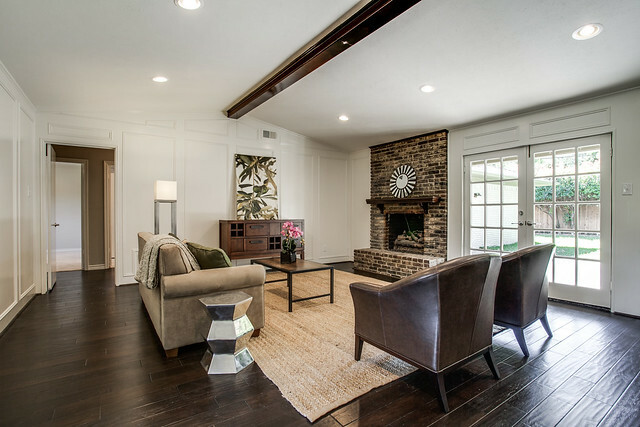 The den reminds me a lot of our house – it must be the beam and all that yummy paneling! But back to the foyer. 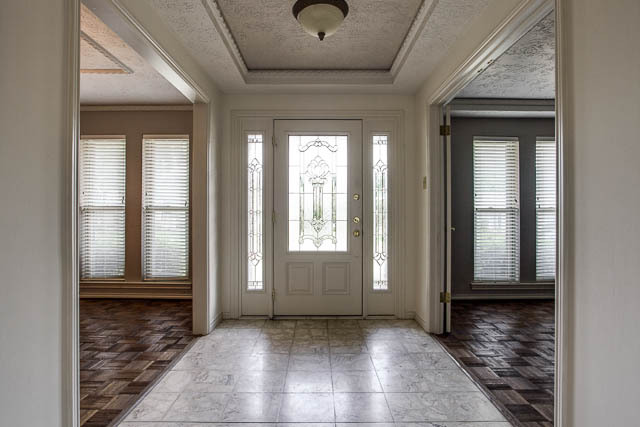 It was okay-looking when we started out, but the floor was dated terrazo, the ceiling had a thick, yucky texture, and the ornate plaster crown molding looked like it belonged on a wedding cake. We jackhammered out the terrazo and smoothed out the ceiling – new hardwoods flow into the adjoining dining room and office. 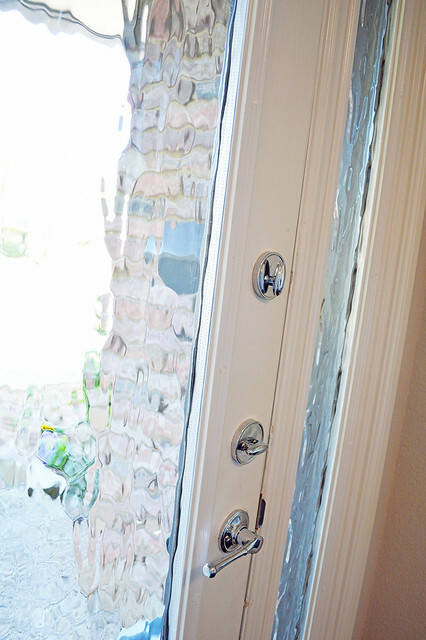 Oh, and do you remember how I told you that we hoped to switch out the brass-toned leaded glass in the front door? We did it, and it looks awesome!! Really, this close-up doesn’t do the new Flemish glass justice. Before the renovation, the dining room had the same thick texture on the ceiling that was in the entryway, as well as the dated moldings. 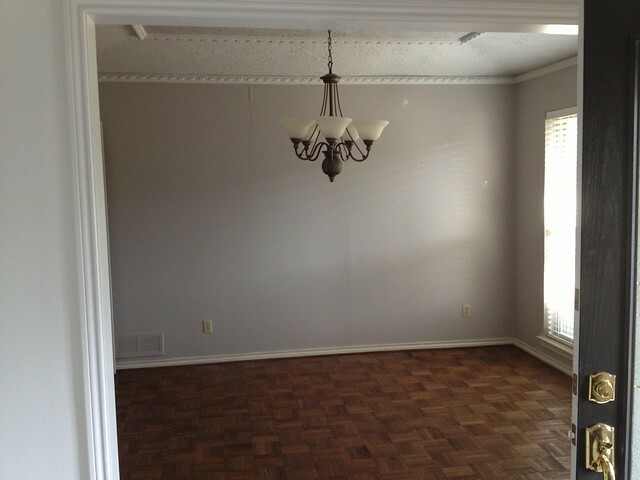 We originally planned to keep the parquet floor, but once we decided to go with prefinished flooring we ran the hardwoods through these formal spaces as well (since we didn’t want to risk the stains not matching). I’m glad we did! 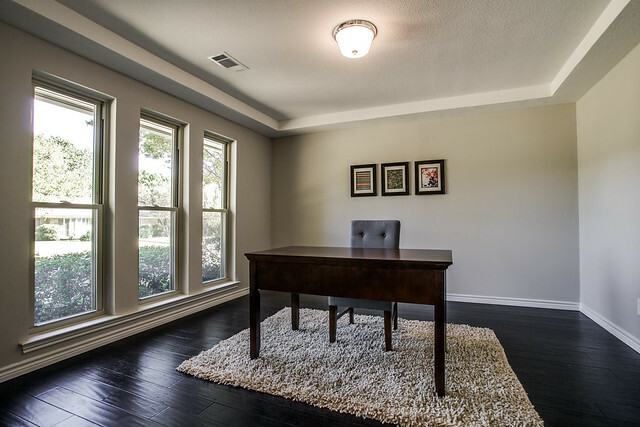 The room that we’re calling the “office” was originally a formal living room right off the foyer. Obviously someone could still use it as a formal space, or a play room, or whatever they want! But here it is in all of its office-y glory. These windows along the front of the house had already been replaced when we came along, but the rest of the windows along the sides and back of the house were original. 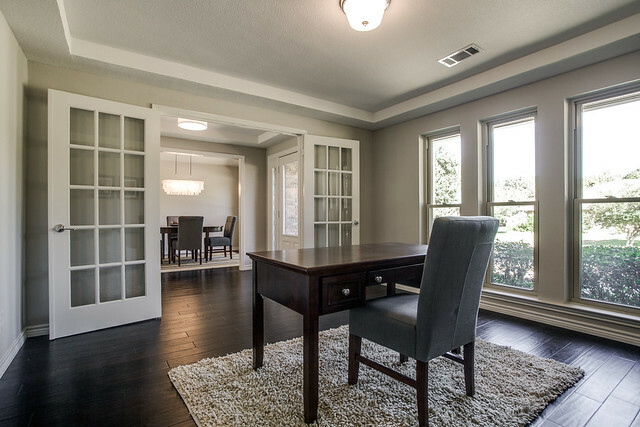 Oh, and check out those French doors! Now we’re heading into the den – you can see the doorway from the foyer on the right in the photo below. That gaping hole in the paneling is actually a pass-through to the wet bar . . . that didn’t last long once we got hold of it! Now the wet bar is closed up and has been turned into a large pantry, the curlicues have been banished from the build-in desk area, and the beam and mantle are stained a rich espresso to match the new flooring. 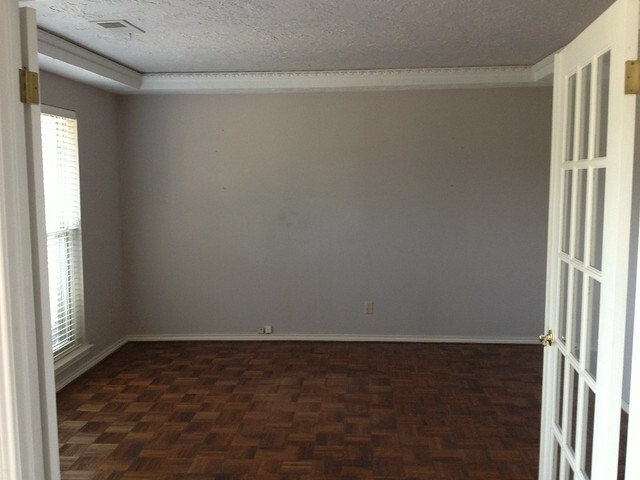 I wish I had a photo of this room before the paneling had been painted! Sigh. It was truly, magnificently scary – kind of like this photo of our house. 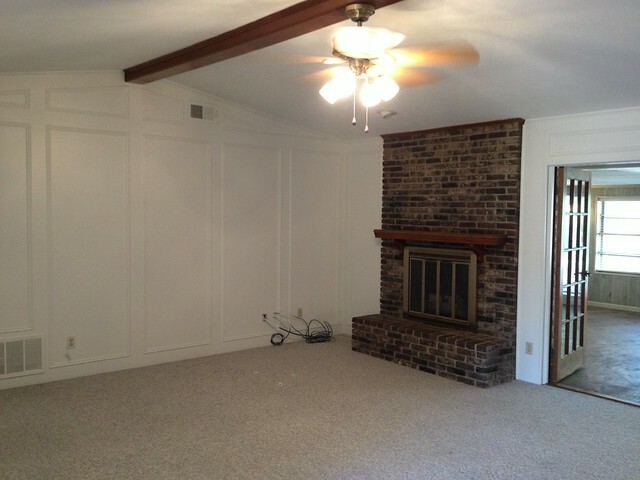 We opted not to pain the brick fireplace, although we did consider it. In the end, I think it goes with the vibe of the house and I’m happy with it. 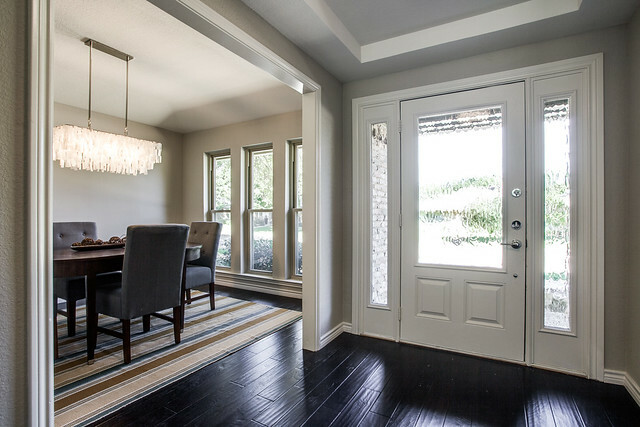 Originally, those French doors opened into the nasty enclosed patio that you can see below. See how much brighter it is now that the “room” was removed? It was a controversial decision to remove that room, but in the end I think it was the right one. Next up – the exterior!! Wow. Just Wow. It turned out so great! The staging really does help see the spaces, I think you do an excellent job of that. 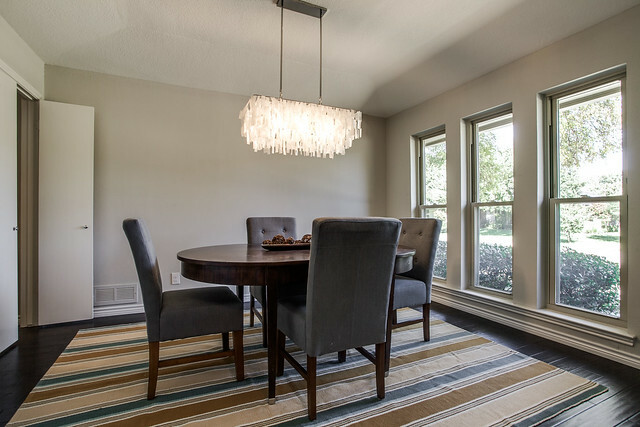 I love that dining room rug! Perfect for what I’ve been searching for. Can you name specifics please? Beautiful! This house is awesome! Do you ever want to keep the houses for yourself? Seriously!? This is beautiful. I love every single choice you guys made especially keeping the fireplace brick the same. And the door turned out so well! Love every bit of it! Great job, Liz! I really love what you did with the house! You’d be surprised how many “renovations” just don’t keep with the times and use the same old travertine in bathrooms (looove the subway tile, mosaic and clean lines you always use), leave the wet bar in (ouch), leave popcorn ceilings, etc. 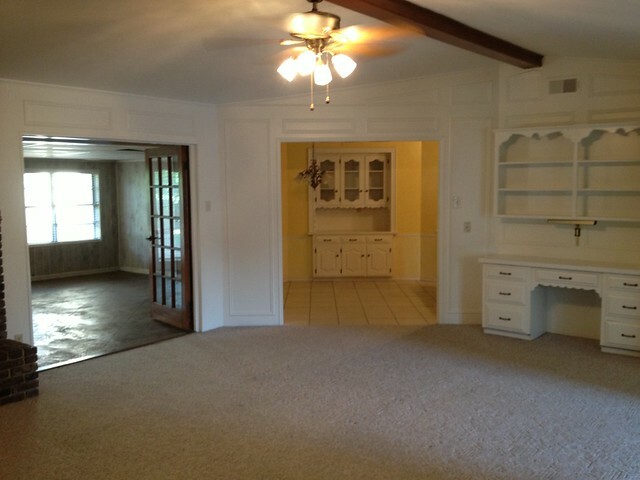 We have recently looked for a house and seen it all (not pretty). You are setting up a really high standard for renovations! I am a big fan!!! The enclosed patio/sunroom is another room that I don’t understand. What are you supposed to use it for? Is it usually heated/airconditioned? What do you do there that you can’t do in your living/dining room? Glad you got rid of it and let more light into your other spaces! 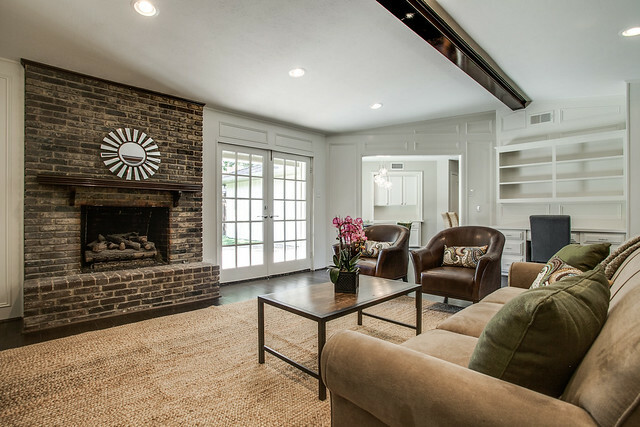 Another tasteful and beautiful renovation! I think most people have come to accept the 2-tone look in cabinets is here to stay. I personally like it! We’ve got those same dark hardwood floors, and yep, I spend my life sweeping. Still think they’re gorgeous, though! Love everything y’all did, as usual. Hope this one flies off the market smoothly for you! Love this! What color are the walls in these three areas, particularly in the den? What kind of paint? Thanks. You have probably answered this question somewhere already, but I wasn’t able to find it looking through all the comments…. So here it goes: what made you decide to NOT stage your previous flips and then go back to staging this time around? Just curious… :-) Great job on the reno!!! Hi Julia, great question! We staged our 2nd, 3rd and 4th flips, skipped staging our 5th and 6th flips, and went back to staging for our 7th flip (this one). We bought all the staging furniture/accessories during that 2nd flip, instead of renting furniture for each individual flip. Because of that, we have specific pieces that we have to work with each time – most of the time those pieces work really well in the flips (we tried really hard to get versatile pieces), but we felt that the furniture wouldn’t work all that well in the 5th flip because of the layout, that it wouldn’t vibe all that well with the more modern vibe and gray tones in our 6th flip (as well as the layout of the gigantic den). So, we opted to skip staging those since we were afraid that staging them with the pieces we had might do more harm than good. We thought about buying some additional pieces, but it would have been things like a sectional sofa, etc. that are a pretty big investment. Maybe we’ll do that some day, but for now we’re just sticking with what we already have (and supplementing here and there with things from our own home). I’m in love with this flip. I think the floors are my favorite this time. Gorgeous. When you have a second, could you share the various paint colors with me? I’m once again on the hunt for the perfect gray and am coming up short. Gray is so hard and I’m wasting money buying the pint sized samples from my BM dealer. Ugh! Hey! Yes, absolutely! I forgot to write it down so I need to go over to the flip and scout up a paint can – I will get back to you! 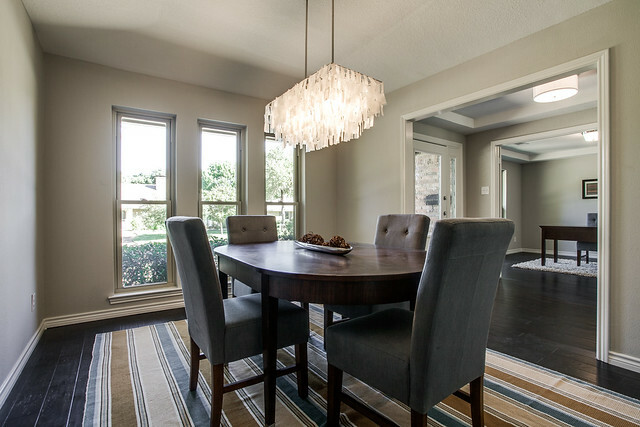 Where is the dining room chandelier from? Thanks so much! We are about to do our first flip in Austin and are very excited and scared all at once. We have a three year old and one year old and running around Floor and Decor is a bit more of a challenge these days!! Any tips you can give for those of us just starting out, or lessons you have learned? I just stumbled across your blog from an old YHL post. 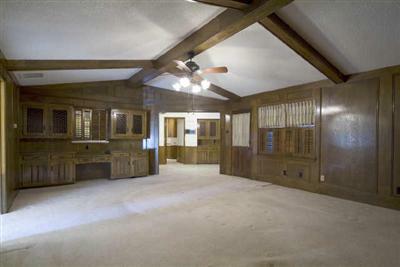 We are closing on a house in 7 days that has the exact same wood paneling (which I know will be amazing once painted). 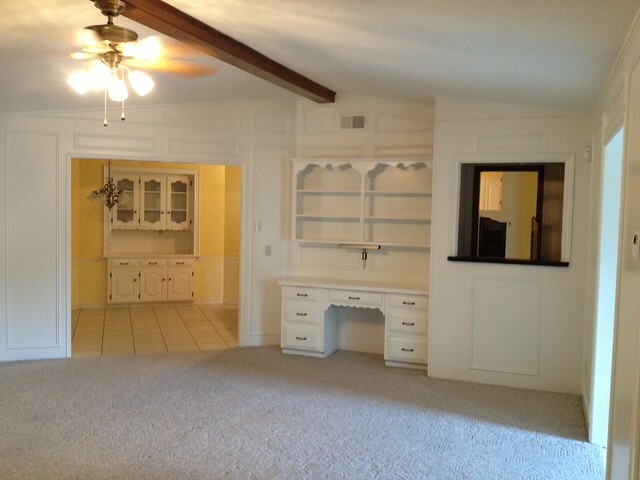 Do you have any special painting tips for the paneling? I don’t even know where to begin!